If you want to introduce your child or any youngster to the magical world of sewing, ensure that they start making their first steps in sewing with the help of the most appropriate sewing machine for kids and for beginners. Finding the best sewing machine for a child is essential, if you want the child to enjoy what they are doing without confusion and frustration while at it, and at the same time stay safe during the process. Most modern machines have so many fancy features and toggles that a beginner or a young child may find the entire feat of learning how to use it quite trying and confusing. This is why, getting a machine which is very straightforward to use and offers the main basic functions and stitches as a first sewing machine is highly recommended. Of course, the exact type of sewing machine you choose depends on the age and the level of sewing they are at. Planning a budget for a sewing machine for a child is also essential, given that it is not uncommon for children to lose interest in a particular hobby or task pretty quickly. The idea is to make the experience enjoyable and satisfying for the kids, so that they stick to practicing and working on various sewing projects in the future. After years of experience with various sewing machines and after some serious research and tests, I have summed up a list of sewing machines which I consider to be the best ones for kids and beginners at the best possible price. These are real sewing machines, rather than flimsy toys, which is the proper way to introduce kids to the art of sewing. 2 Buying Guide: How to choose a kid friendly sewing machine? This model from Brother is a top pick for children or beginner seamstress in sewing because it has nearly all features you should be looking for when choosing the best one for a kid or a new seamstress. It is very simple to use, intuitive, and the multiple stitch varieties and functions are very simple to learn and use in your sewing projects. The built in 50 stitches (utility, heirloom and decorative) which each feature multiple stitch functions (87 in total), including sewing of: buttonholes, edge overcasting, decorative top stitching, zipper sewing and many more. Very useful stretch stitches which are perfect for difficult stretchy fabrics, such as fleece or other elastic textiles. A simple bobbin winding and replacement which involves just one single step. Easy threading of both top and bottom threads which is perfect for even the youngest kids. The automated needle threading function is a must feature for the kids. Fancy quilting stitches for any kind of quilt sewing project. The sewing machine is computerized and features a very useful and intuitive LCD display, so that you can easily adjust the stitch to fit your needs. The display shows the exact stitch you have chosen, along with the length and width, so that you can easily fix and adjust it by pressing the simple push buttons for stitch selection. There is a highly convenient chart featuring all available stitches on the front. Buttonhole stitching is available in five sizes to fit all kinds of buttons. It comes with 6 different kinds of presser feet for: overcasting, zippers, monogramming, buttonhole and buttons as well as one for blind stitching. A very handy manual is included in the package – it is available in English and in Spanish. It is sold with an amazing 25 year limited warranty, so you are making a true long-term investment with this lovely tool. It is very compact and lightweight and has a comfortable carrying handle, which makes it perfect for carrying around and taking it to classes, school or anywhere. The work area is bright and LED lit, so the child will be able to have a clear view of what is going on and to stay safe during the sewing project. The vertical spool pin is similar to the ones fitted on professional sewing machines. It allows for a more consistent feed of the thread, and is an excellent option for specialized threads or metallic ones. Your child will love playing around and experimenting with the wonderful decorative top stitching options provided by this model. Apart from the extra feet, the package includes also: a 3 needle set, 3 bobbins, a ball point needle and a twin needle, an extra spool pin, a foot pedal, seam ripper, a brush for cleaning and a screwdriver, plus it has a handy quick start and setup guide for beginners or for returning sewists. The machine is solid, quiet and with very little vibrations. It works only in countries with 120V AC electric current is supplied. The automatic needle threader does take some time to figure out how to use properly. Overall, this affordable and high quality sewing machine is a perfect selection for children or for people who are returning to or are new to sewing. The handy startup guide, the intuitive LED display and push button system, combined with the fact that it is very light, compact and comes with a 25 year warranty is what makes it an outstanding choice when shopping for a sewing machine for a kid. This nifty and multi-functional sewing machine is another one of my top picks for machines for children. It is incredibly lightweight, features a highly intuitive and useful LCD display and has a safe speed control stop and start push button which is perfect for younger children who do not feel comfortable with a foot pedal yet. The abovementioned option for manual control of the speed with the start and stop switch which is an excellent alternative to a foot pedal. The bright LCD display which shows the exact stitch, its width and length so that simple adjustments can be made even by kids. A handy compartment in the free arm for accessory storing, to keep the sewing area nice and tidy. A top drop-in bobbin which is easy and quick to wind and replace, and is jam resistant, so the child can sew seamlessly and without hassle. A very detailed bilingual user manual and a startup guide to get you started and to guide you along the process of learning how to use the machine. A 25 year warranty as well as completely free support via phone at all times. The machine comes with nine very useful additional presser feet for: monogramming, overcasting, buttonhole, button fitting and zippers, as well as a walking, blind stitch and quilting foot. Also included in the package are: needles, a twin needle, three bobbins, a spool pin, seam ripper, eyelet punch, a cleaning brush, screwdriver, power cord, a protective case and an oversized wide table. Extremely lightweight and easily portable which is great for carrying around and for travelling. 60 built in stitches, including 7 styles for buttonhole stitching and various fun decorative top stitching options. An easy to use automatic threader for the needle. A free arm which can be used for stitching hard to reach hems, sleeves and cuffs. A bright LED lighted sewing area allowing for a clear view of the work being done. If you want to introduce your child to the magnificent craft of sewing, crafting and quilting, this affordable, durable and extremely lightweight sewing machine is an excellent choice. Easy to use and control the speed, safe to handle and with an intuitive design which will allow for even the youngest kid to learn the basics of sewing, this one is a highly recommended option for kids or newbie seamstress, as well as for sewing enthusiasts. My third choice from Brother, this easy to use sewing machine is another one which you can safely purchase for your small seamstresss. It is as big as a full sized sewing machine and yet is light and portable. It features all 10 basic built in stitches necessary for completing a sewing project or mending a garment, including: zigzag, blind hem, stretch stiches as well as four auto size buttonhole stitching options. They are printed on the front of the machine for convenience and for clear access while working on a project. There are four snap on presser feet for: zigzag, buttonhole, button fitting and zipper sewing. A one-step bobbin winder, with top drop in for easy winding, replacement as well as for jam-resistant work flow. An intuitive dial to select the stitch you want. Bright LED lighting of the work area. A very informative DVD with startup and operation instructions, as well as a bilingual detailed user manual. 25 years limited quality warrantee along with free technical support for the entire life of the machine. The package also includes a needle set with 3 needles, four bobbins, four feet, a darning plate, foot controller and a DVD with instructions, plus the user manual in English and Spanish and a quick start guide to let you start sewing as soon as you take the machine out of the box. It doesn’t have an automatic needle threading feature. The foot pedal cord is slightly shorter but given that a kids will be using it, this should not be too much of an inconvenience. This is a basic and yet very reliable sewing machine – perfect for new seamstresses, retuning sewists and for teaching children how to sew. Simple to operate, very affordable and yet durable, the Brother XM1010 is a great choice for a sewing machine for learning. It has all the necessary basic functions and features to allow your child to complete various types of sewing and mending projects, and will last for years ahead, so it is definitely a sound investment! Last but not least from the models from Brother which have made it on my list for the best sewing machines for youngsters, the XM2701 is a machine you shouldn’t pass by when shopping. It is exceptionally easy to use, versatile and can be used for learning as well as for working on a wide variety of sewing, mending, quilting and other projects. 27 built in stitches, including: blind hem, decorative, stretch and zigzag stitches plus buttonhole stitching with automatic sizing options. 6 snap on and quickly and easily changeable presser feet for: zippers, buttonholes, buttons, narrow hemming and blind stitching. An easy to use needle threader – great for kids. Easy stitch selector with the help of a lever on the side. A jam resistant, easily winded and replaced top drop-in bobbin to make the use of the machine as hassle free as possible. A very useful DVD with instructions for use, a detailed user manual in two languages, a startup guide and lifetime free technical phone support. A 25 year limited quality guarantee by the manufacturer. A built in free arm for making sleeves, hems and cuffs. The package includes: 6 presser feet, a 3-piece set of needles, a darning plate twin needle, extra spool pin, 4 bobbins and a screwdriver. The Brother XM2701 is a wonderful sewing machine has been designed and made for hassle free use, which means that it is a superb option for teaching kids how to sew. It has features for quick and hassle-free threading, winding and use of the top and bottom threads. The intuitive design is very suitable for young children. It has versatile features and functions. It is light, portable and yet is quite sturdy, plus it also comes with a lifetime technical phone support and a 25 year quality warrantee (limited). This cute Hello Kitty sewing machine may look like an ordinary toy, but actually it is a fully functional real ¾ model sewing machine which is perfect for introducing your young child to the world of sewing and crafting. It can handle some rather heavy duty projects and yet is portable and lightweight so kids can carry it around to sewing classes or when visiting friends. It is part of the Janome Hello Kitty Sewing Machine series which features some of the cutest models I’ve seen lately. It has 11 built-in stitches, including a couple of neat stretch stiches and a four step buttonhole stitch to match buttons of all sizes. A free arm for sleeve and cuff sewing. A handy storage for the accessories. Portable and lightweight (11lbs), it is fitted with a comfortable carrying handle. A three piece feed dog for hassle free and safe use. A foot lift which is extra high. Can make stitches of up to 5mm wide and 4mm long. A simple and easy to handle bobbin winder (push and pull). Snap on, easy to install and change presser feet (3 included in the set). An intuitive stitch selection dial and easy tension control operation. A reverse stitching lever to lock stitches easily and securely. The Hello Kitty design may become a little to childish for your growing kid, but it is still quite cute and adorable anyway. It features only the basic stitches and functions which makes it perfect for novices and for young children, but as they progress a more versatile sewing machine may be needed. Not so good for light textiles, but on the other hand – it can handle heavy textiles with ease. This adorable ¾ sized sewing machine is a perfect choice for your young daughter. It is a fully functional, sturdy machine, which can be carried around easily and which has all the basic functions and stitches necessary for a first sewing machine. It is easy to operate, so it is a great option even for the youngest of kids. Another model from Janome which has made it into my top choice list of sewing machines suitable for children, this awesome Janome 2206 is a full sized one available at a great price. 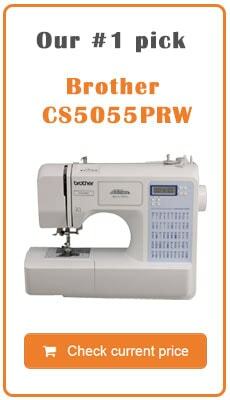 It has multiple functionalities, is safe and easy to use and will be the perfect first sewing machine for your child. 6 built in stitches with simple to control stitch length (maximum 4mm) and width (maximum 5mm) with the help of an intuitive dial at the front. A front loading bobbin for clear access and winding with a push and pull winder. A built in cutter for thread. Snap on, quick to replace presser feet and an extra high foot lift for safe and straightforward use. A speed of up to 860 stitches per minute. A four step buttonhole stitching option for various types and sizes of buttons. Manual tension control of the thread. A five piece feed dog, and a drop feed. A couple of vertical spool pins which are retractable. A nice dust cover and a handy accessory drawer in the free arm for all craft items. It is made in America and comes with a 25 year quality warranty. You can start using it right after taking it out of the box with no significant adjustments made. A needle plate with very useful seam guidance. The package includes: feet for zippers, buttonholes and blind hems, 3 bobbins, a needle set, a seam ripper, screwdriver and a convenient dust cover. Overall, this is an affordable, sturdy and good quality sewing tool which is a great choice for a first sewing machine for a child or a returning or beginning seamstress. It is easy to use, has all necessary features and stitches to complete a relatively complicated sewing project and comes with a 25 year warrantee. Yet another product by respected manufacturer Janome, the Magnolia 7318 sewing machine is an exceptional gift for young kids. It is offered at a competitive price, and has all the features to ensure that your deaughter masters and practices the basics of sewing and that it can begin using it safely and by itself in no time at all. 18 built-in stitches, including a 4 step buttonhole and a balance adjuster for different fabrics. The maximum width of a stitch is 5mm and the maximum length is 4mm. An simple-to-use reverse stitch button for securing a stitch. The bonus package has: a Muffling mat, 10 bobbins and a pack of size 14 needles. Jam-proof, top loading hook bobbin system – perfect for beginners or your young seamstress. Compact, lightweight and portable – kids can carry this machine to a friend, a sewing class or when travelling. A convenient storage drawer for accessories. It has a very intuitive make and even young kids can quickly find their way around. Great for sewing, quilting and crafting. A 5 piece feed dog and an extra high presser foot lift option. Lightweight, easy to use and safe – the Janome Magnolia 7318 sewing machine is budget friendly and durable and can be used both by newbies and young children as well as by enthusiasts who want to complete their next sewing project without hassle and with ease. It features all necessary 12 basic stitches, including: straight, zigzag and crescent with two optional needle positions. Great for not so complicated sewing, quilting, appliqueing and crafting or mending projects. A free arm and a very convenient storage for all the accessories. An easy reverse stitching function for finishing off stitches and a choice of 5 different straight stitches for easy zipper sewing. Very lightweight, it weighs only 5 pounds and can easily be carried around to sewing classes, dorms or when travelling. A special finger guard and a presser foot which will help keep the fingers of the kids safe from the needle. It is very easy to set up so you can start with the lessons immediately after buying it. Convenient and easy to understand threading diagrams. A simple top drop-in bobbin for easy placing and winding and a handy clear cover. An intuitive and simple stitch selection dial. It works seamlessly with a wide variety of different fabrics, such as: cotton, chiffon, denim, flannel as well as stretchy knits. The package includes a needle threader, bobbins and a detailed instruction manual. Easily adjustable thread tension and a four point feed dog system. An extra high presser foot lift for easy and safe operation. There is no adjustment of the stitch length or width. In conclusion, this is a perfect budget friendly first sewing machine for a child. It is easy to master and use, and has all the basic functions which will allow your child to learn how to sew and operate a sewing machine. It is impressively lightweight and compact and can literally be fitted in a suitcase. A perfect choice for a child, it is easy to use and offers great protection for the fingers. A metal frame which will keep the sewing machine in place and allow for skip free work. A very nice a smooth fabric feed ensured by the stainless steel bedplate. Automatic needle threading to avoid the hassle and save the time for having to thread it manually. Automatic bobbin winding and easy placing. A speed of up to 750 stitches per minute. A free arm for easy access and sewing of sleeves, cuffs and hems. 6 basic built in stitches (straight, blind hem, satin, zigzag, a 4-step buttonhole stitch and a scallop stitch. Selecting a stitch of your choice is very easy and intuitive. Automatic tension control for easy set up and use. Easy set up due to the useful threading diagrams and user instructions. Dual spool pins which allow for attractive two needle sewing of parallel stitches. A free online class for owners of the machine. Three presser feet for all purposes, for buttonholes and for zipper stitching. An easy preset of the width and length of the stitches. Apart from the three presser feet, the other accessories included in the package are: a darning plate, class 15 bobbins, a set of needles, spool pin felts, a screwdriver for the needle plate, a brush for the lint, foot control pedal and cord, a detailed instruction manual and an easy start up guide. A limited 25 year quality warrantee. In my opinion this is also a great sewing machine for beginners who want a reliable and yet affordable tool to use for learning how to sew. It has all the necessary functions and stitch types which kids will need to master before proceeding to work with a multifunctional and more advanced sewing machine. It is very easy to start it up, and will take very little time to learn how to properly operate and work with it. It is affordable and yet is an excellent teaching tool and can also be used for various homemade projects, including making garments, dolls clothes, mending clothing, crafting, quilting and others. Overall, this is a great option if you want a reliable and budget friendly sewing machine for your home or to buy as a gift. If you are looking for a simple and yet sturdy sewing machine which is extremely easy to set up straight out of the box, then this model is definitely one you should take a closer look at. It is definitely one of my top choices for the most suitable sewing machines to buy for the fun sized seamstress. Easily adjustable stitch width and length with a turn dial. 32 built in stitches, including: 6 basic stitches, 19 decorative stitches, 6 stretch stitches and 1 buttonhole stitch. An automatic reverse stitching function. A heavy duty frame made of metal to ensure that the sewing machine endures the tear and wear of practicing and use, as well as to provide skip free sewing. It also keeps the machine in place for a safer environment for youth. A free arm for easy access to garment parts such as sleeves, cuffs or hems. Four different snap-on presser feet, including: an all-purpose foot, a button foot, a buttonhole foot and a zipper foot. Also included in the package are: a pack of needles, bobbins, a darning plate, a seam riper, a lint brush, a quilting and edge guide, a dust cover and foot control and power cord, as well as an instruction manual. A 25 year warrantee by Singer (limited). Whether you are looking for one of the most suitable sewing machines for a child or for a newbie in sewing of any age, you will not go wrong if you proceed to buy this particular sewing machine. It is extremely easy to set up and start using which will save a lot of time and frustration, and it is pretty easy to understand and use. It is safe, has multiple stitch options, the dials and controls are intuitive and it comes at an excellent price! 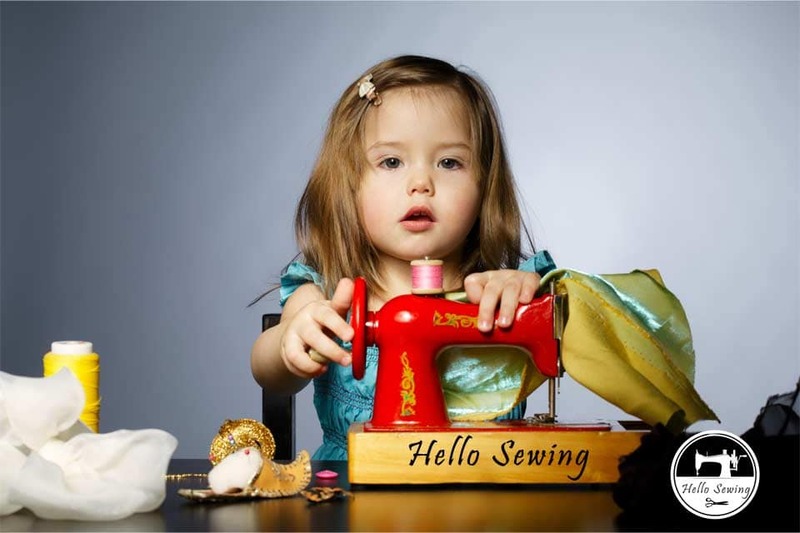 Buying Guide: How to choose a kid friendly sewing machine? The first thing to keep in mind when picking the perfect sewing machine for a child is its age and its ability level. Generally, older children will be better in learning how to safely and properly move the fabric in the right direction while they sew it, and will find it much easier to handle the various speeds and stitching selections. Younger children may need more time and practice in learning how to simultaneously hold and move the fabric and using the pedal with their feet at the same time. The sewing machine should be simple and safe enough to use in accordance to the age and the ability level it has. You can even start by showing them the basic types of hand sewing stitches to gauge their interest. The most important piece of advice I always like to give to people who ask me about the most appropriate sewing machines for their kids is that toy-like machines are junk, get your kids a real sewing machine, so that they can learn how to sew and use one properly and as early on in life as possible. Choose a sewing machine which has all the necessary basic sewing features and is as easy to use as possible. This is crucial if you want to keep the kids interested in this craft and to keep them away from getting frustrated by the complicated functionalities and the hard to use modern sewing machines for enthusiasts and pros. Once the child learns how to properly use this one, you can consider moving them on to a more state-of-the art sewing machine! Start simple and work your way up – this is the best way to teach the kids how to properly complete their first sewing project. A machine with an intuitive design is a better choice not only when shopping for children but for grown-ups as well. Functions such as: automatic needle threading as well as easy to load bobbins will make your life much easier and working on sewing projects much more fun. Simplicity is key to learning how to properly use a sewing machine. Choose a model which has all the basic stitches and functions for your child’s first steps in sewing. This will make the task of teaching children to sew much easier, plus will help you save that extra cash you will need to pay if you want to buy a more complicated and modern model with a huge multitude of stitching options and other functionalities which will hardly be used anyway. Choose between a machine with a pedal or with a push button depending on the capabilities and dexterity of your daughter or son. Some children may quickly learn how to control the speed with the help of a foot pedal, whilst others may find this a tad too difficult, in which case a push button model will be more suitable for starters. Also, pick a machine which has snap on feet which securely stay attached when you are working with them. This is essential for the comfort and safety of young kids. An auto threader option will save you time and will help keep kids interested rather than frustrated by sewing. There are a few things you can do to help them get started. When shopping for a young child, you should pick a model which provides proper and easy to handle speed control – usually a sewing machine with a push button instead of a foot pedal is a wiser choice for younger children. It should also have an easy to locate and open bobbin slot, so that the kids can easily install and wind it up. Look for a machine which has the most important basic stitches, including: straight, reverse and zigzag. Believe me, a young child will have fun and enjoy using a machine which has only 6 stitches and will be able to make many of our easy sewing projects suitable for kids. As she improves and grows, it can be able to expand its skills and use up to 25 stitching options for completing more of those listed here. Using a sewing machine has its risks for the wellbeing of the kids, so safety should come first when you are picking the right sewing machine for a youngster. Look for a model which has reliable finger guards to keep the small fingers of the kids well away from the needle. Also, choose a model which has easy to use and proper speed control, so that the stitching can be done in a safe and controlled manner. The dimensions and the weight of the sewing machine is also an essential factor to keep in mind, especially if your child is planning to take it to classes, to school or when visiting a friend or relative. This is why, I recommend that you pick one which is more compact and lightweight. The more opportunity the little one has to practice and work on its own machine – the better the learning process will go. Even if the sewing machine has only the basic stitches and functions, it is still an investment of your money you are making, so make sure that you buy a machine which will last for longer and which has the functions which are necessary for completing more complicated sewing projects for the time when the kids start working comfortably with it. Look for features such as buttonhole stitching as well as its capability to work with thicker fabrics as well. Choosing a very childish design is very cute, but think about the near future! Time flies and kids grow up quicker than you have anticipated, so make sure that the machine will suit its preferences and needs as it grows up. The lower the budget – the more likely that the machine will not endure for too long, so it is reasonable to think about this purchase as a long term investment. There are models which come at a great price and can easily serve their purpose for decades ahead. Naturally, if the child is very young, you should consider getting the simplest and safest one around, plus it should be easy to operate by a small person with small hands and feet. Explain the basic sewing machine stitches and don’t dwell too much in the specifics. Just one small step at a time. Refer to our guide here and pick the options your model has. If the child is 6 years or older, than you can move on to a bigger sized option with more functionalities. I truly hope that my short reviews and tips for buying the most suitable and safe sewing machines for a kid have helped you make a choice of your own. I once again would like to state that it is great to introduce your kid to the world of sewing as early as possible if you want them to become truly interested in sewing as they grow up. It is essential that you buy a real sewing machine rather than spending money on a useless toy sewing machine. Even the youngest children can learn the basics about using the machine, with some guidance and help on your side. By getting them a machine which is easy to set up and handle, you will be able to keep them away from becoming bored and frustrated and will help them learn to love to sew and to crave for working on more and various more complicated projects in the future. Spend wisely and choose carefully – and you will have one happy child as soon as you get them that perfect sewing machine to start them learning and enjoying the art of creating garments, quilts and other projects!